How to bring life back to damaged wicker pieces? 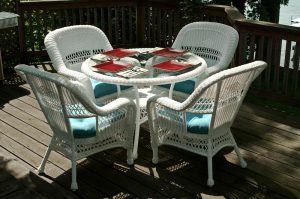 Wicker furniture has become more popular as more people are looking to expand their homes by adding a patio. If you find it difficult to afford new wicker pieces, look investing in second-hand wicker furniture and repairing it to suit your home and taste. Most often pieces like chairs and wicker sofas will be the most worn, rather than tables or side stools. Here are a few tips to bring back damaged wicker pieces to life. Inspect the damage – Before you start your repair, examine your furniture to ascertain the damage. Firstly, get rid of dirt and dust by washing your furniture with warm soapy water. Remember only wash your furniture on a hot sunny day, so that your furniture gets enough sun to dry. Always flip your furniture over, to examine the bottom and wash out any dirt and dust. Weaving the strands – Weave new basket weaving reeds where breakage has occurred by pulling the old weave to the back of the furniture so that it will not show. Weave in and out to make sure that the cane strands look neat and tuck the ends to ensure your weave is in place. For spaces that are difficult to reach, look at pre-soaking the reed to give it more flexibility. Tighten loose ends – Look at tightening any loose twine around the joints of the legs. Stitch these ends with a strong thread that is transparent. Wicker Paradise suggests using a darning needle for this purpose as sometimes strong threads will not thread through the eye of a normal needle.